Just like Aelita, XANA's monsters can be considered guardians of the virtual world... However, they are on XANA's side, playing as the "bad guys." They can be distinguished in many ways: places where they are encountered, speed, attack power and especially appearance. But no worries! The common monsters work on Lyoko. The specters are, in this point of view, in a category of their own. They always are on Earth and are the weapons of XANA's attacks. They aren't materialized and don't hatch from anywhere but are created in the electric current and come out of electricity sockets. That being said, some monsters can be sent on Earth by materialization in scanners, probably from Lyoko. In this context, the monsters are not the defenders of towers anymore but become the direct pawns in the attack. XANA already materialized a large number of Kankrelats from a scanner and three Krabs (episode 26 “False Start” and episode 39 “A Bad Turn”). Their main goal is finding the heroes and killing them while blocking the way to the factory. Their bodies aren't organic, but mechanic, so they are like guided dangerous robots. When Ulrich cuts off the leg of a Krab, we can see circuits and wires coming out the stump. The examples of monster Teleportations are less numerous than examples of materializations because the process is older. The case of a Teleportation of a monster takes place in episode 83 “Hard Luck”, from a Desert Replika. Kankrelats were inaugurating this process for XANA. (Let's note that, on the villain side, William will also be Teleported in episode 92 “Cold Sweat”). The advantage is that the process is exactly similar to the heroes' one. For more information about the Teleportation process, here is some help. To explain in a simple way what a Teleported monster is, it's not complicated: imagine a polymorphic clone which, instead changing into Ms Hertz, changes into a Kankrelat! Well, now you perfectly see what a Teleported monster is. It's a specter which looks like a monster from Lyoko. The difference between the Teleportation of monsters and the Teleportation of heroes is this: the monsters don't need to go through a anchored tower and the Skidbladnir. XANA Teleports them from an unknown place. But it's logical that it happens that way: the heroes anchor the Skidbladnir to a tower with the goal to create a link with a Supercomputer and to launch the Teleportation near this computer. XANA already infects the machine. It doesn't need to be linked: it already is in the supercomputer! In a martial side, the Teleportation of the monsters is no more interesting than their materialization. 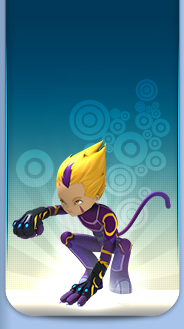 This is because the Teleported Kankrelats have to fight against...Teleported Lyoko Warriors! And not Kadic students. 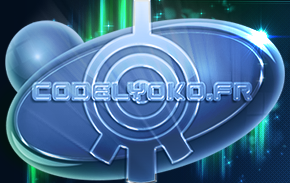 From then on, they had no advantages, the fight is just a replica of a fight on Lyoko, but in a terrestrial arena. A Teleported monster only has exceptions when its Teleported body is too damaged, which leads to deteleportation. The Kankrelats hit by katanas or tessen fans are sent back to Lyoko. However, taking a beating is not the only thing in the modest existence of a Kankrelat, there is attacking too! For a specter, namely a gaseous body maintained by electric currents and voltages, what's easier than creating lasers? It only has to channel energy, probably electric too, or to generate it by the friction of the atoms of its own body. On this, the monster's laser is similar to a materialized monster's one: it isn't activated in the same way but it is still devastating and very dangerous for a human being. 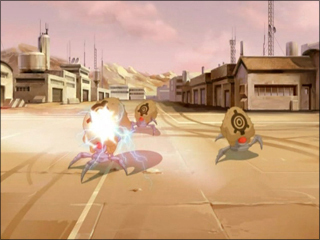 As for the Teleported Lyoko Warriors, they have to avoid or ward off the shot at the risk of failing the mission. 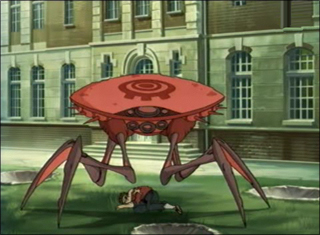 Yet, the Kankrelat is a weak monster which wasn't a threat on Lyoko anymore. It is logical that Ulrich and Yumi had no problems with destroying the supercomputer of the attacked base. 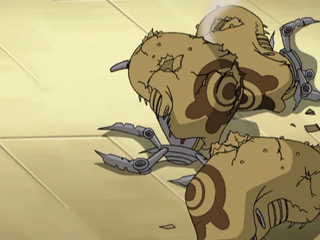 The only real difficulty was that the Kankrelats were many and that's their main power, on Earth as on Lyoko. We only have to imagine the dangers the heroes would have endured if XANA Teleported another monster. I'll leave you to imagine a Megatank downtown during rush hour!